Prerelease image of the Wii U version. Since this picture was taken before the game is released, the icon displaying "overalls" corresponds to the coat icon, a minor error. 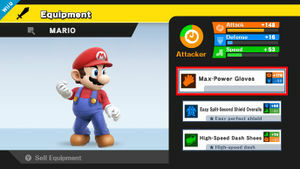 Names are also inconsistent with the final release (compare "Easy Split-Second" to "Perfect Shield Helper" and "High-Speed Dash" to "Sprinter"). Equipment labels are also different. Compare "Attacker" to "Bruiser". Equipment is a major aspect of Super Smash Bros. for Nintendo 3DS / Wii U. Players initially have three pieces of equipment: one Brawn Badge, one Protection Badge, and one Agility Badge, but they can earn more equipment through a variety of ways, including unlocking them via Classic Mode, Smash Run, Trophy Rush, Street Smash, Target Blast, Challenges, and amiibo prizes. Equipment raises one or more stats (while lowering others), but they can provide additional effects, positive or negative (equipment with negative effects, however, are generally more powerful, and have a smaller stat penalty). Players can sell equipment for a small amount of gold; more valuable and powerful equipment generally cost more gold. Equipment comes in three categories, which are Attack, Defense, and Speed. Attack Increases damage dealt for all attacks, including special moves and items. It also increases attack knockback, and freeze frames. Negative attack values decrease attack damage, knockback, and freeze frames. Defense Lowers the amount of damage and knockback that the fighter receives from attacks. It is unclear if the stat affects weight and shield strength as well or if they are indirectly affected by the damage decrease. Negative defense values make the fighter take more damage than normal, and receive higher knockback. Speed Increases the fighter's mobility on the ground, and in the air, along with increasing its jumping height, falling speed, and fast-falling speed. Landing lag is also reduced. Negative speed values make the fighter slower on the ground, and in the air, along with decreasing its jumping height. Landing lag is also increased. Any stat that has a majority trait, has a label attached to it. If there are two stats that are roughly equal, the label shows both traits; for an example, a character with mostly attack and speed have the "Spd/Atk" label. Every stat-boosting equipment has a drawback, depending on the type of equipment. The bigger boost the equipment offers, the bigger the penalty. What stats an equipment offers is variable, and some equipment have better stats overall (such as both higher stat gain and lower stat penalty for two equipment of a kind) and are worth more when players sell them. Finally, speed affects the total weight limit of Smash Run powers that a character can carry in the Nintendo 3DS version. Increasing a character's speed decreases the total amount of weight available, while increasing defense, which decreases speed, allows more powers to be held. The default amount of powers a character can hold also varies for each individual character. For example, Bowser, by default, can carry more powers than Fox. Each character can wear only three pieces of equipment, and equipment stats can be stacked. However, stat values are not able to go higher than 200, regardless of if the value is positive or negative. 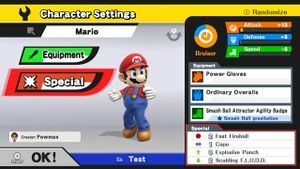 Once the player has finished giving equipment and setting different special moves, if there are any, the player can save the combination of equipment under a name, including the character's color (which can be altered if players are selecting their character under the character select screen under the Custom menu). There are ten available slots, so players can save a total of ten combinations for one character. Equipment can be turned on or off, although characters cannot use equipment in All-Star mode, the Stadium modes, Trophy Rush (3DS only), or With Anyone during online play. Likewise, certain events in the Events game mode prevent the player from using equipment as well. Also, whenever fighters use their Final Smashes, their equipment will temporarily be disabled, but the opposing fighters' defense values can still affect how much damage the Final Smash will deal whenever it hits. On one final note, the player can only hold up to 3,000 pieces of equipment. The limit, however, can end up decreasing if the player has any copied fighters who have equipment equipped onto them. If the limit is reached, the oldest equipment gets removed to make room for new equipment. Dr. Mario has a unique trait, where he has passive equipment statistics implemented onto his attributes. He'll act as if he's equipped with a +15 Attack value, and a -50 Speed value, resulting in his attacks dealing 1.12x their normal damage, his ground mobility being 0.832x their normal values, and his air mobility and jump height being 0.808x their normal values. This modification occurs before any actual equipment is applied, and the player can't fully reset the Attack and Speed values back to 0. Below is a list of all the equipment types that exist in the game. The equipment names are from the North American version of the game, but if there are name differences between the North American and European versions, then the European name will be displayed below the North American name. How often the player can acquire a specific equipment type is determined by how many fighters are able to use it. Some equipment carry special attributes, which can either be positive or negative. Unlike with the equipment that doesn't have bonus effects, bonus effect equipment do not have a rarity level. Equipment that offers positive effects usually have stronger stat drops than stat boosts. How massive the stat drop is when compared to the stat boost can depend on the strength of the bonus effect; for example, the Critical Hitter equipment always hinders a stat more than what it boosts, while the Hard Braker equipment may still offer a stronger stat boost than a stat drop. Equipment that offers negative effects are depicted by red text. Negative bonus effects typically offer weaker stat drops and stronger stat boosts to compensate for the negative effect. Because of this, the stronger negative bonus effects are usually much less common to acquire than most positive bonus effects. Also, some equipment can give one item at the start of the match; if the item is turned off, via item switch, the item does not appear. The item will never appear if the player is playing an event match, however, since event matches do not allow outside items to be used. On a side note, some bonus effects will never activate when the player is fighting against Master Hand, Crazy Hand, Master Core, or any Smash Run enemies. Also, not all bonus effects can be stacked. Note: Some bonus effects are named differently between regions. The European names are displayed below the North American names. Air Scrapper Improved air attacks 1.15x attack power while airborne. Air Defender Improved air defense 0.75x damage received when in midair. Air Piñata Weakened air defense 1.2x damage received when in midair. Air Tapper Weakened air attacks 0.7x attack power while airborne. All-Around Trade-Off Improved trade-off ability Start with 60% damage, but slowly gain attack, defense, and speed. Heavy Jump Heavy jumps 1.4x speed when falling. Slow Glider Decreased lateral air movement 0.8x lateral air-movement speed. Hopper Weakened jump 0.8x jump height. Auto-Healer Auto-heal capability Heal damage gradually over time. Beam Sword Beam Sword equipped Start battles with a Beam Sword. The stronger the attack, the longer the reach. Post-Snack Attacker Improved attack after eating 1.4x attack power for 15 seconds after eating food. Post-Snack Defender Improved defense after eating 0.5x damage received for 15 seconds after eating food. Post-Snack Invincibility Invincibility after eating Become invincible for 5 seconds after eating food. Post-Snack Powerhouse Power up after eating Attack, defense, and speed rise gradually for 15 seconds after eating food. Post-Snack Speedster Improved speed after eating 1.38x speed for 15 seconds after eating food. Countdown Bonus Countdown bonus Greatly improved launch power for the last five seconds of a battle. Crash Lander Increased landing impact After landing, take more time to start moving again. Critical Hitter Critical-hit capability Attacks get a 20% chance of dealing extra damage. Crouch Healer Heal while crouching Slowly heal damage while crouching. Desperate Attacker Improved attack in a crisis 1.7x attack power for 20 seconds when damage reaches 100%. Desperate Defender Improved defense in a crisis Take 0.33x damage for 20 seconds when damage reaches 100%. Desperate Immortal Invincibility in a crisis Gain 7 seconds of invincibility when your damage reaches 100%. Desperate Specialist Powered up in a crisis Slowly increase attack, defense, and speed for 20 seconds when damage reaches 100%. Desperate Speedster Improved speed in a crisis 1.55x speed for 20 seconds when damage reaches 100%. Dodgy Dodger Weakened dodge ability Gives a bit less time to dodge an enemy attack. Double Final Smasher Chance of a double Final Smash After using a Final Smash, you have a 20% chance of being able to use it again. Mid-Air Springer Improved double jump 1.3x midair jump height. Double-Jump Drag Weakened double jump 0.7x midair jump height. Escape Artist Improved escapability Escape more easily from being grabbed, stunned, etc. Healing Smash Ball Healing Final Smash Heal damage gradually while you have the Final Smash glow. Fire Flower Fire Flower equipped Start battles with a Fire Flower. Roast your enemies! First Striker First-strike advantage If you land the first strike of the battle, you will be invincible for 10 seconds. Mega Metaboliser Increased healing from food 1.5x damage healed when eating food. Pro Glider Increased lateral air movement 1.25x lateral air-movement speed. Edge-Gripper Easier edge grabs Increased range for grabbing stage edges. Quick Stopper Improved braking ability Stop on a dime even when dashing. Hanging Amateur Decreased edge-grab duration Hang on to the edges of stages for half as long. High Jump Improved ground jumps 1.3x jump height from the ground. Hyper Smasher Hyper smash attacks Charge smash attacks for longer to get 1.3x power. Imperfect Shield No perfect shield Only get a normal shield no matter how good your timing is. Insult to Injury Prone damage dealer 1.4x damage when hitting a prone opponent. Walloper Battering item boost 1.5x attack power to battering items. Item Hurler Stronger item throws 1.5x attack power to thrown items. Item-Fumbler Weakened item throws 0.7x attack power to thrown items. Pitcher Throwing item boost Item-throwing range increased. Shooter Projectile item boost 1.5x attack power and ammo for items that fire projectiles. KO Healer KOs heal damage Recover damage when you KO an enemy. Springer Improved jump 1.2x jump height. Hanging Ace Increased edge-grab duration Hang on to the edges of stages for twice as long. Lip's Stick Lip's Stick equipped Star battles with a Lip's Stick. Hit an opponent to plant a damaging flower. Lo-Jump Weakened ground jumps 0.7x jump height from the ground. Dawdler Decreased walk speed 0.8x walking speed. Meteor Master Improved meteor effect 1.5x power when using moves that launch opponents downward. Moon Launcher Improved launch ability 1.3x attack power when launching enemies upward. Mr. Saturn Mr. Saturn equipped Start matches with Mr. Saturn. He does huge damage to fighters' shields. Nimble Dodger Improved dodge ability Gives a little extra time to dodge an enemy attack. Solid Smasher No-flinch charged smashes You cannot be launched by standard attacks when charging a smash attack. Perfect-Shield Whiz Easy perfect shield More easily nullify attacks when blocking at the last second. Meagre Metaboliser Decreased healing from food 0.7x damage healed when eating food. Fast Bat Smasher Quicker bat swing Faster smash attacks when using the Home-Run Bat. Quick Smasher Quick smash attacks Charge smash attacks faster when holding the attack button. Ray Gun Ray Gun equipped Start battles with a Ray Gun. Blast your foes with a laser! Risky Respawner No respawn invincibility Get no invincibility after being KO'd. Safe Respawner Extended respawn invincibility Invincibility will last three times as long after being KO'd. Sluggish Shield Recharge Weakened shield regeneration Recharge your shield more slowly. Perfect Shield Blast Explosive perfect shield Shield against an attack with perfect timing to create an explosion. Healing Shield Health-restoring shield Recover health when shielding relative to the power of received attacks. Shield Counter Mirror shield When shielding, reflect some damage back at your attackers. Speedy Shield Recharge Improved shield regeneration Recharge your shield more quickly. Smash Ball Attractor Smash Ball gravitation Automatically draw Smash Balls to you. Smash Ball Hog Smash Ball retention When glowing with your Final Smash, resist losing it when attacked. Smooth Lander Reduced landing impact Start moving again more quickly after landing. Skater Skating traction 1.5x movement speed on land, but watch that you don't slip! Power-Walker Increased walk speed 1.3x walking speed. Sprinter Increased run speed 1.3x running speed. Star Rod Star Rod equipped Start battles with a Star Rod. Wave it to fire star-shaped projectiles. Jogger Decreased run speed 0.8x running speed. Sudden Death Gambler Chance of lucky Sudden Death Get a 50% chance of going into Sudden Death with only 100% damage. Smash Ball Power Powered up Final Smash Attack, defense, and speed rise gradually while you have the Final Smash glow. Super Scope Super Scope equipped Start battles with a Super Scope. Attack with charge shots or rapid fire! Floaty Jump Floaty jumps 0.6x speed when falling. Edge-Slipper Harder edge grabs Decreased range for grabbing stage edges. Unharmed Attacker Improved attack at 0 damage 1.5x attack power while damage is at 0%. Unharmed Speed Demon Improved attack/speed at 0% Attack and speed gradually increase while damage is at 0%. Unharmed Speedster Improved speed at 0 damage 1.32x speed while damage is at 0%. Positive values can range from 10 to 85. Negative values can range from 0.5x to 0.7x the positive value. The rarity title of the equipment determines how high and how low that equipment's positive value can be. Common equipment have a positive value of 10 to 30. Uncommon equipment have a positive value of 31 to 60. Rare equipment have a positive value of 61 to 85. Equipment with bonus effects have a stat modifier that subtracts from either the positive value or the negative value. Positive bonus effects have lower positive values. Negative bonus effects have lower negative values. After the stat modifier has been applied, the equipment's positive and negative values never go below 5. If the equipment type is Brawn Badge, Protection Badge, or Agility Badge, its positive value and negative value are multiplied by 0.72. This is done to compensate how all characters are able to use badge equipment. The multiplier is applied "after" all the other calculations are made. All stats are rounded down to the nearest integer (if necessary). Note: Equipment that's unlocked by completing challenges do not follow the calculations that are mentioned above; their stats are always fixed. Below is a table of the stat modifiers that are applied onto the equipment that has bonus effects. While the stat modifier value normally subtracts from the equipment's positive value, stat modifier values that are colored red are subtracted from the equipment's negative value instead. An amiibo can be customized with equipment as well. Unlike with playable fighters, amiibo fighters can be equipped with any kind of equipment, regardless of whether or not the original fighter is compatible with the equipment. However, the amiibo will consume any equipment that it receives, causing the equipment to be lost permanently. When fed equipment, the stat boosts and drops that the amiibo receives are smaller than what the normal fighters are given, but to compensate for this drawback, an amiibo can be given more than three pieces of equipment, enabling its stats to gradually increase. However, like with the normal fighters, amiibo fighters can only learn up to three bonus effects. If it has three bonus effects and consumes another equipment with a bonus effect, it must choose which effect to remove, including the incoming bonus effect; if the incoming bonus effect is removed, however, the stat increases and decreases are altered. Also, there is a limit to how much equipment an amiibo can be fed in one session; if the amiibo is full, it has to fight in a match before it can consume more equipment. An amiibo's stat total is capped at 120, but the stat total can be modified by feeding the amiibo any equipment that has bonus effects; positive bonus effects decrease the stat total, while negative bonus effects increase it. The player can also sell equipment to earn gold. How much gold that is earned is determined by the equipment's stat values, along with how strong its bonus effect is (if it has one). The following table displays the selling price range for the equipment that does not have any bonus effects. p and n are the equipment's positive and negative values. 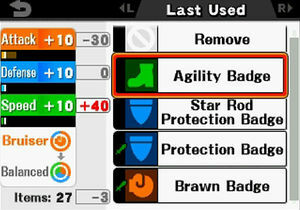 The values are taken after the badge equipment multiplier has been applied (if the equipment type is Brawn Badge, Protection Badge, or Agility Badge). After players have sold any equipment, in order to keep the gold that they gained, they have to also save any changes that are made to their customized character. If the character customization is not saved, the game will act as if the player has sold nothing. The table below displays the default power limit values for the fighters in Super Smash Bros. for Nintendo 3DS. These values are only used in Smash Run, where they can enable fighters to carry more Smash Run powers. The power limit can be modified by adjusting the speed stat, with positive speed values lowering the power limit and negative speed values raising it. The first Challenge Panel contains no unlockable equipment; if players meet the conditions listed, they must first uncover enough challenges to reveal the next panel, and once the next panel is revealed, the items are automatically unlocked. Below are the requirements and rewards in the Nintendo 3DS version of the game. Below are the custom equipment that can be acquired by completing the challenges in Super Smash Bros. for Wii U. Unlike in Super Smash Bros. for Nintendo 3DS, however, not all unlockable equipment are badges. Double Final Smasher Protection Badge Clear Classic at intensity 9.0 without losing a single life. Vampire Brawn Badge Play as Lucina and score 8 or more KOs in a single Solo Cruel Smash. Critical Hitter Sword Clear Solo Classic in 12 minutes at intensity 9.0 while playing as Marth. Smooth Lander Brawn Badge Collect all of the special moves. Moon Launcher Protection Badge Destroy a total of 50000 or more blocks in Trophy Rush. Item Hitter Agility Badge Collect 700 unique trophies. Countdown Drill Play as Bowser Jr. in Stage 1 and get a score of 150000 or more in a single game of Solo Target Blast. KO Healer Arm Cannon Get a chain of at least 100 in Trophy Rush without taking any damage while playing alone and as Samus. Caloric Immortal Protection Badge Clear All-Star on hard difficulty with 8 or more characters. Desperate Specialist Agility Badge Clear a Master Orders ticket with a difficulty rating of intense. Perfect-Shield Helper Brawn Badge Clear the true All-Star mode on hard difficulty. Unharmed Attacker Agility Badge Get 120 or more KOs in a single Endless Smash. Trade-Off Attacker Protection Badge Clear a Master Order on Very Hard difficulty or higher. Speed Skater Shoes Clear Solo 100-Man Smash within 3 minutes while playing as Sonic. Unharmed Speed Demon Agility Badge Get a max combo of 50 or more in Training. Speed Crasher Agility Badge Clear Crazy Orders after 5 or more turns. No-Flinch Smasher Protection Badge Get 50 or more KOs in a single Endless Smash. Hyper Smasher Brawn Badge Clear All-Star on normal difficulty or higher. Nimble Dodger Agility Badge Collect 50 different special moves. Air Attacker Brawn Badge Collect 15 different special moves. Shield Regenerator Protection Badge Customize a fighter in Custom. This page was last edited on March 1, 2019, at 00:46.